So do I Deida. This ones a cracker. Thanks Deida and Toto...have to admit at this time of year they do seem to lift the border ! Thank you for the kind comments ..so nice to see some flowers and now they are self seeding its such a joy . Why can't I grow these? Is there a secret about them? Absolutely lovely. I have to say I've never heard of them, but as you know apart from geraniums and marigolds I haven't heard of most plants. That's why I so love GoY. Love the sound of Kirrie dumplings. What do you grow in your garden, then, apart from geraniums and marigolds? Lots of anonymous plants or just those two? LOL. You'll have to post photos of them in turn to get them all ID'd. Ginellie...Spritz s idea is good ! You would be inundated with info ! Lol. Love the drumsticks, also. Never heard of them called Kirrie ndumplings before. I will have to ask your local nurseryman if he knows the name. 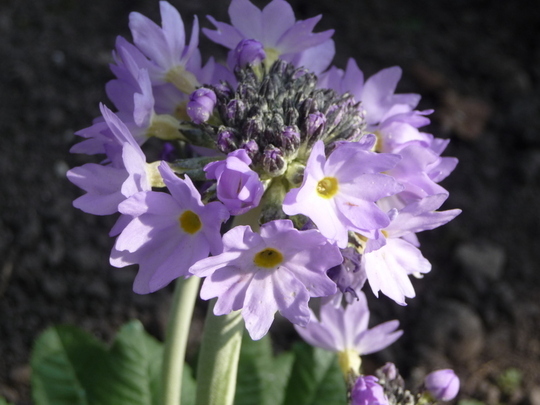 These primula like a moist soil, Spritz. I am sure that your garden should have a suitable space. Agree Bulbaholic...ours are by the pond. These are lovely, wish they liked my acidic soil. I'll just have to admire yours ! Sorry they dont like your soil Flc..we are lucky and they seem to be spreading.Only planted last year ! You're right Spritz and BB, I do have other things growing but mostly I don't know their names. I have been growing seeds on the kitchen table for a while, some look quite well, others not. I'm not sure what they are because I mixed the packets up. I shall try to send a picture of the ones that are growing because I'm sure you will be able to tell me what they are. I've never seen these before - lovely!